(Host) With a little more than three weeks to go before the Burlington mayoral election, the candidates are making their case for receiving a potential endorsement from the city’s Progressive Party. Progressive Mayor Bob Kiss is not seeking reelection, and his party has decided against fielding a candidate to succeed him. So that leaves Independent Wanda Hines, Republican Kurt Wright and Democrat Miro Weinberger. The candidates faced off in a debate last night at Burlington’s City Hall. Kurt Wright said in his time on the City Council he has worked closely with the Progressive Caucus, even though they often disagree. (Wright) "I continue to have great relationships with them. I continue to fight for them and make sure that their voices are able to be heard on the City Council and they’re not frozen out." (Host) In making his case, Miro Weinberger credited Progressives for much of the city’s recent success, like the transformation of Burlington’s waterfront. (Weinberger) "A good deal of credit for that belongs with political leadership we’ve had and Progressives. That said I’m not losing sight of the fact that what really matters in this election is the support of everyday Burlingtonians." (Host) For her part, Wanda Hines wants a Progressive endorsement because, she says, the party is embedded in city politics. (Hines) "The progressive community has been with us – the mindset, the culture and values – for the last 20 something, 30 years. Everything goes in a cycle. It happened before, it will happen again. The Progressive community will always be a part of Burlington." (Host) On Sunday, Burlington Progressives held interviews will all three candidates. But they haven’t yet decided whether they will endorse one of them. 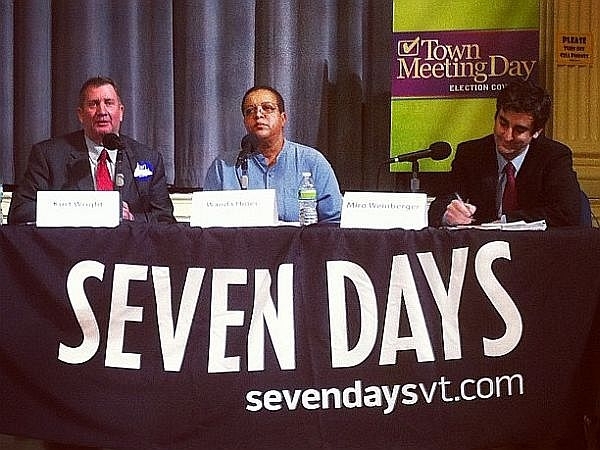 VPR participated in Thursday night’s debate, which was a co-presentation of Channel 17 and Seven Days. Courtesy of Channel 17, watch video of the candidates answering questions from media panelists Andy Bromage (Seven Days), Kristin Carlson (WCAX) and Kirk Carapezza (VPR), as well as from the public.